Various new brands and models of cheap hearing amplifiers surface in the market by the day. And making the right choice from the overwhelming number of options is more than challenging. 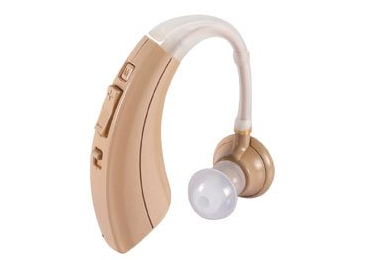 This post discusses all you need to know about cheap hearing amplifiers and features a review of some of the best options available to those who are suffering from mild to severe hearing loss, but are on a very tight budget. If this describes you or someone close to you, then read on to understand how to choose the right cheap hearing amplification device for you. Cheap hearing amplifiers: Are they worth buying? Well, they say you get what you paid for; so if you pay a meager price, then expect nothing impressive. That runs true for most products and services. And hearing amplifiers are no exception. 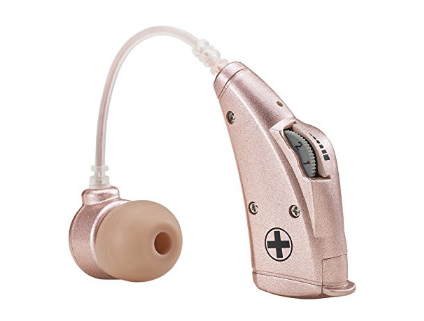 While it’s true that hearing amplifiers are much cheaper alternatives to the uber-expensive audiologist-prescribed hearing aids, the best ones still sell for no less than a few hundred dollars. And if you’re on the lookout for one that costs less than $30, you might end up wasting your money on a device that does nothing to help your condition. No doubt, hearing amplifiers like the Empower hearing amplifier, Otofonix hearing amplifier, and the Tweak Focus hearing amplifier are the best you’ll find in the market at the moment. Although these devices are fairly priced at a few hundred dollars, some people are still unable to afford them. But the good news is, there are some cheaper alternatives that also work well, and that might be suitable for those on a tight budget. So, in all, most hearing amplifiers that sell for cheap are likely to be useless at best, or harmful at worst. But there are few exceptions that really work. And we’ve reviewed some of them below. To help you make the best choice when buying a budget hearing amplifier, we scoured the market to compare several of the options available, matching them up in terms of real buyer reviews, product features, manufacturer trust, and other important factors. And after our detailed research, we were able to come up with these 6 effective and reliable ones. The Britzgo Hearing Amplifier BHA-220S is a digital hearing amplification device that comes in a simple but modern and attractive design. It’s a behind-the-ear (BTE) device that works well to help people with varying degrees of hearing loss. 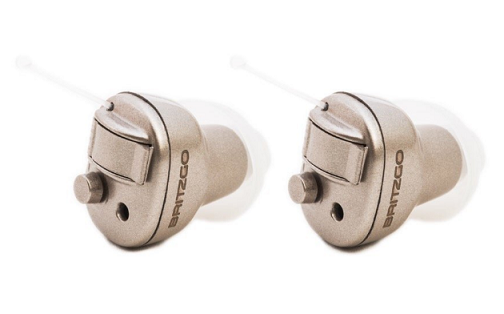 One of the most interesting aspects of the Britzgo Hearing Amplifier BHA-220S is its universal ear feature, which makes it suitable for either ear. This eliminates the need to search for the specific match for the ear. The device is sturdy and well built, so it can out up with abuse and dropping for a very long time. The Britzgo Hearing Amplifier BHA-220S allows for extremely long battery life. Each battery runs for around 500 hours or more depending on the frequency and duration of use. This makes it far better than most rechargeable alternatives, which usually require recharge once in every few days. The device package include the hearing amplifier unit, free travel carrying case, instruction manual, cleaning brush, 2 P675 batteries, and 3 domes for small, medium, and large sizes. In all, the Britzgo Hearing Amplifier BHA-220S is a very good alternative to the more expensive hearing amplifiers. For those on a tight budget, it’s a suitable device for improving hearing during conversations, indoor activities, and social gatherings. The Easyus EZ-220 / VHP-220 Digital Hearing Amplifier is another budget hearing amplifier that works well for people who are suffering from hearing loss but cannot afford the cost of costlier options. The device’s universal tube can fit either ear, so there’s no need to worry about specific sides. Powered by a replaceable LR44 battery that delivers for more than one month, the Easyus EZ-220 / VHP-220 Digital Hearing Amplifier can help the user save a lot of battery costs due to its low power consumption. It features adaptive noise reduction and adaptive feedback cancellation, which means background sounds won’t interfere with the exact things you want to hear from the TV or someone else you’re conversing with. 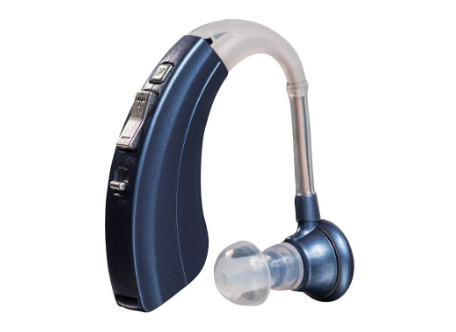 The Easyus EZ-220 / VHP-220 Digital Hearing Amplifier is easy to use. Anyone can easily figure out how to power the device on and off or adjust the volume — thanks to the obvious positions of the buttons. More interestingly, the device comes with a memory function that enables it to save your last volume settings. This means you won’t have to adjust the volume each time you power on the device. For those wearing glasses, using this device won’t be a problem at all, as it fits well even with the user’s glasses in place. And its tan color makes it blend well behind the ears of most users. The product pack comprises the amplifier device, three ear tips of different sizes, a cleaning brush, and a nice storage case. The DTMCare New Digital Hearing Amplifier UP6B73 is a behind-the-ear style of hearing amplifier made for hard of hearing people on a very tight budget. Available in six different colors (white, silver, rose gold, gold copper, black silver, and brass), the device is well built and easy to use. The DTMCare New Digital Hearing Amplifier UP6B73 sports an analog volume control dial rather than the digital type, but it also gets the job of volume adjustment done perfectly. The device fits into either ear. Powered by one P13 button that delivers for about 100 hours, the device produces a user-friendly sound output. It’s a great option either as a first-hand option or a backup for a more expensive option. The only in-the-ear model on our list, the Britzgo Hearing Amplifier BHA-603D is another affordable hearing amplifier made specially for those who prefer a barely visible option. It’s built based on digital technology and comes in grand gray silver color, which blends well with the skin color of most users. The device features a digital chip which helps to reduce unwanted background noise. However, to get the best of the device’s functions, you’ll need to push it well into your ears to create a tight suction. This requires that you attach the tip of the appropriate size. The device runs on replaceable long lasting P10 batteries. 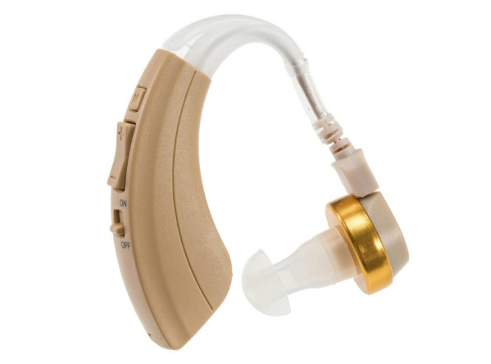 The Britzgo Hearing Amplifier BHA-603D is easy to use. The power and volume adjustment buttons can be tapped easily with one finger. The product pack contains a pair (left and right) of hearing amplifiers, two travel cases, two P10 batteries, three pairs of ear tips (small, medium, and large sizes), and an instruction manual. The last — but not necessarily the worst — on our list of cheap hearing amplifiers is the NewEar High Quality Digital Ear Hearing Amplifier. It’s a behind-the-ear amplifier that helps people who have varying degrees of hearing loss but cannot afford the more expensive models. The device can fit either ear, as its tube can easily be adjusted in either direction. The NewEar High Quality Digital Ear Hearing Amplifier is powered by replaceable LR44 batteries, and the device’s battery economy is impressive. The product pack contains 3 different sizes of ear plus (small, medium, and large), 3 LR44 batteries, 1 cleaning brush, 1 instruction manual, and a carrying case. Tends to amplify unwanted sounds — sometimes.